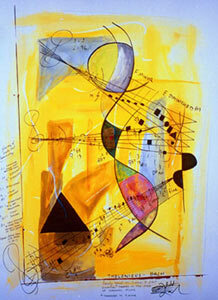 Enter into Jeff Laibson's world of musically inspired art, flowing and melodic, full of rhythm, movement and silence. Jeff Laibson's emotionally evocative paintings are a joy to behold and a treasure to own. Browse through the pages of his online art gallery and let his paintings reveal themselves to you. Wine and cheese, anyone?